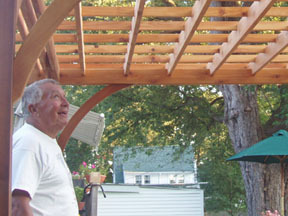 Pergolas, Pavilions, and Other Outdoor Structures at Baldwin Outdoor Comfort. After ten years of designing and building custom pergolas we a wide have selection of pergola styles and materials to choose from. We can supply you with the perfect pergola to fit your setting. 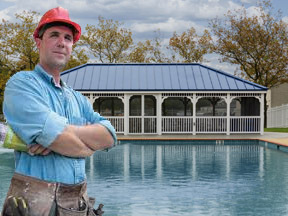 A Pavilion may be more appropriate for your needs, so we offer four styles of pavilions ranging from mountainside-rustic to commercial to highly refined residential. Take a look! Our team has handled dozens of high end commercial projects for a variety of institutions. We look forward to working with your team. We like to under promise and over deliver. We've been selling direct-to-customer since inception in 1987. The direct communication speeds design and adds clarity. We are a small enough company to provide immediate service. Pergolas and Pavilions are typically the last stage of a back-yard-makeover. We work especially hard to keep projects moving so you can stay on or ahead of schedule. LEAD TIME: In most cases, our standard pergolas and pavilions can be designed, created, and shipped in less than six weeks from plan confirmation. 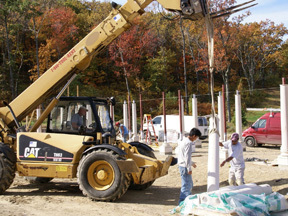 Most of our structures are custom designed and custom built. We specialize in simplifing a complex world by anticipating problems and solving them proactivly. We pride ourselves on being easy to work with. 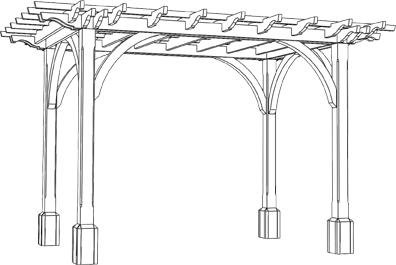 Just provide us with a few pieces of information and we will create a CAD drawing showing your site and how it relates to our pergola or Pavilion. We make adjustments until the structure works for you. We work hard to create a kit which a homeowner with limited tools and experience can assemble in a weekend. We are careful to drill every hole, label every part and provide all the hardware you will need to complete the project - with ease. 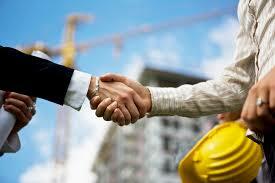 Building contractors are some of the busiest people around; Always working and often overwhelmed. 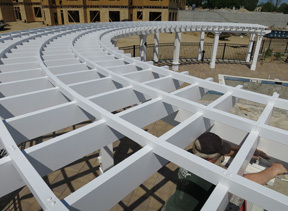 They put their trust in Baldwin Pergolas to ensure that the pergola or pavilion will come together without a hitch. 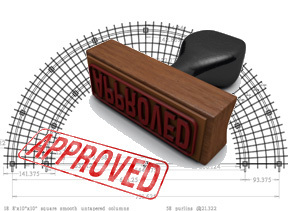 Custom CAD drawings, custom instructions and attention to detail ensure success. We do not offer dealerships. Everyone pays the same price. This policy allows us to put quality first, as it should be. 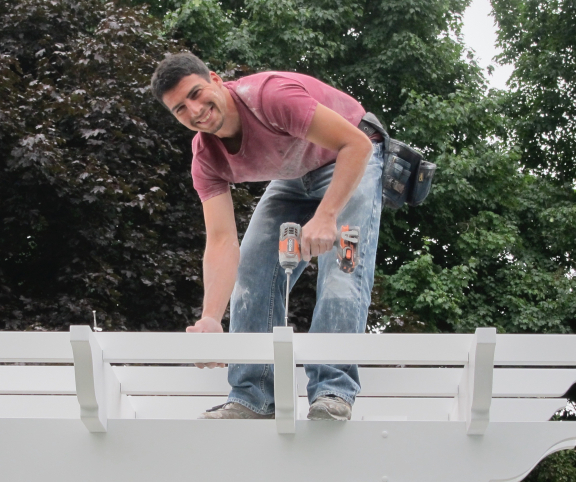 We make you a promise: Baldwin Pergolas will save you time and make you look good! 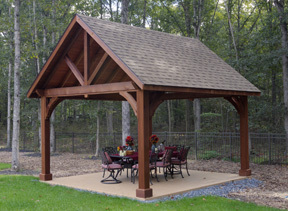 Builders typically include a Pergola with a model home. It's also quite common for builders to specify pergolas around pools, entry's, parks, playgrounds, lakes and common areas of all sorts. Let our experience with what looks good help you to implement a theme for your project which will tie everything together. Quotes are free. Email us your plans and we'll help you with your budget forecasting. We will travel the world if the project requires it. Architects are all about the details. How does this connect to that? How do you conceal your fasteners? What are the maximum spans? We do better than answering questions. We can provide DXF drawings which you can pop right into your plans. We'll also work with your to solve engineering challenges. Please give us a chance to provide the things you need. Send us your plans. We are also "all about the details". 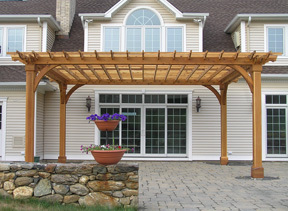 We make it easy for your to include one of our pergolas in your next project. Some projects require more... More imagination, more focus, more skillful execution. That's where Baldwins excels. We develop custom solutions for challenges such as anchoring rooftop structures or concealing water lines. We solve problems with the highest quality craftsmanship and materials. 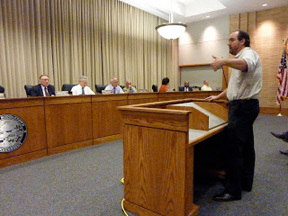 Prevailing wage and LEED certified. Give us a try. Start by visualizing your dream come true outdoor area. Draw a sketch. Add measurements. This is the MAGIC part where Baldwin Pergolas shines. Max and Matt will help you pull it all together. This is the easy part. Watch as your dreams become reality. All it takes is vision. We have worked for some of the most distinguished in America. As a cabinetmaker and woodworker, I send you kudos on your system, the communication that we've had, the quality of the product. It's a pretty simple kit that arrived and it installs just about as easily as your website suggests. On a personal level, it's really cool to make connections with other people that have the same sense of pride in their work. This stuff is as much about service as it is product. You guys are awesome. Very impressed with the product so far: quality, thoughtfulness, engineering, form and fit and everything. Thank you so much again for taking care of the shipping issue for me - it really speaks volumes to your business integrity. We actually put most of it up last weekend. The pergola made such a dramatic difference in the backyard. I'm very happy with the investment. There is still landscaping to do but I thought you would like to see the completed pergola on location. The quality and packing were quite excellent and I've received rave reviews about the pergola from neighbors. Finished pergola is beautiful. Neighbors have commented very positively. View of yard from inside the pergola is difficult to describe. Can 'look through' the pergola lattices, but also 'look' out the 'windows' onto the garden. Very three-dimensional experience. One neighbor said that if he lived in our house, he would sit and read every day in the pergola. I completed the project and like to share some of the pictures with you. Everything was putted together nicely with all your works already in place. Thanks for a job well done. Sorry it has taken so long to get these pictures to you (a few years to be truthful). We love our pergola and also the furniture. It really does make the space like a room outside. Your product is fabulous. It was easy to assemble and it makes a profound difference in the space. it was a joy working with you and Cheri. We both hope you continued success in your endeavors. 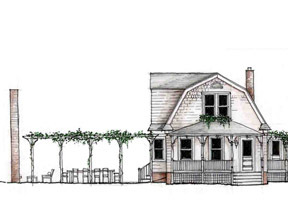 The pergola is the focus of our garden and patio area. It succeeded in bringing it all together as we had hoped! The shade is more than ample. I do not believe that I would change any of the specs or proportions if I had a chance to alter the order. It worked out marvelously and have received tons of compliments! Your attention to detail and quality construction is to be commended. Thank you for a job well done. Max & Chris, Thank you both for your help on this project. My 13 year old son & I installed the pergola the day you delivered it. It took us about 6 Hours and it looks great. You can see the completed project here. Fell free to use whatever pictures you like. Thank You. "First, man defines his architecture. Forever after, his architecture defines him." We realize that we cannot build every pergola in the world, so we've decided that we'll be the company that builds all the really nice pergolas in the world. © 2019 Baldwin Pergolas, Baldwin Lawn Furniture. Subscribe to our newsletter and stay up to date with the latest news and maintenance suggestions!